But the fact that Morris applies the same basic methodology to The Unknown Known that he did to the The Fog Of War makes the contrast between the two men meaningful, and says something profound about Rumsfeld, too. No amount of coaxing from Morris—an expert coaxer if there ever was one—is going to squeeze remorse or revelation from Rumsfeld, because Rumsfeld isn’t remorseful and has as little interest in being candid or reflective now as he did when he was stonewalling the press during his years in the Bush administration. So what Morris does instead is make stonewalling itself the subject, because now that we know the results of Rumsfeld’s policies, strategies, and tactics, we can see behind the rhetorical smokescreen he’s still putting up. He becomes the avatar for an administration that steadfastly refused to reexamine its reasoning and covered its ineptitude in ideology and spin. Though Rumsfeld’s actions prior to and following the events of 9/11 are the focus, The Unknown Known looks back at a long career in public service, including his six years as a Congressman from Illinois in the 1960s, his posts under Richard Nixon, his promotion to White House Chief Of Staff and later Defense Secretary under Gerald Ford, and his consideration as a possible running mate for Ronald Reagan. In Morris’ telling, Rumsfeld comes across almost like a Zelig figure, present at various historical moments—the Nixon tapes, Sara Jane Moore’s assassination attempt on Ford, the Pentagon lawn before first responders arrived on 9/11—without being the central figure. That changed when he became Defense Secretary under Bush, especially once post-war Iraq collapsed into chaos and Rumsfeld came under scrutiny for misjudging what would happen once Saddam Hussein was driven out of Baghdad. Morris challenges Rumsfeld on that and other issues, like the rationale for invading Iraq over the supposed certainty of Saddam’s cache of WMD and the treatment of detainees at Guantanamo Bay. That Rumsfeld concedes nothing is not a flaw of The Unknown Known but a feature, especially since Morris can counter so easily with what we do know now about the absence of WMD (Rumsfeld implausibly speculates that Saddam could have destroyed the evidence) and reports of torture and appalling conditions at Guantanamo. 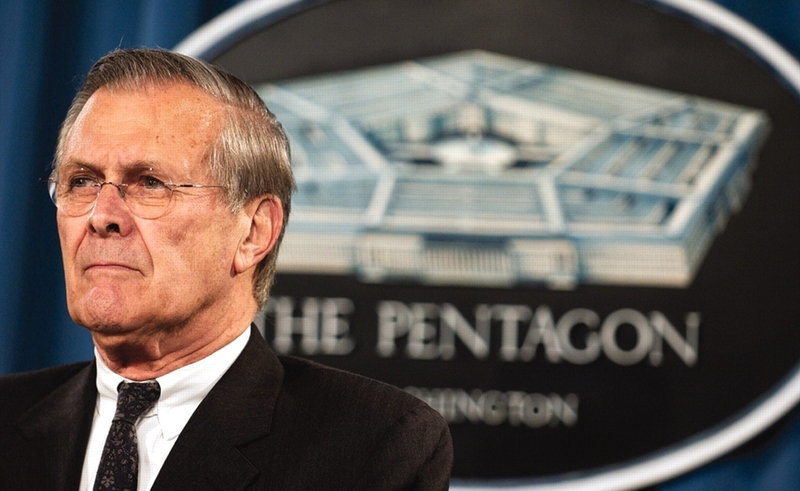 As with the reporters who were rebuffed by Rumsfeld’s famously elusive press conferences at the time, Morris can only ask the questions—if Rumsfeld isn’t forthright about answering, that’s no fault of the director. Evasions can be revealing, too. Yet the film’s true focus is language, which is the source of Rumsfeld’s power. For one, Rumsfeld is the Yogi Berra of politics, a master at throwing out phrases of artful paradox, like “All generalizations are false, including this one” or “The absence of evidence is not the evidence of absence.” But as Defense Secretary under Bush, he was also obsessed with dictionary definitions of important terms—“terrorism,” “guerrilla warfare,” “scapegoat”—so he could figure out how best to deploy them. Morris fills the screens with words and definitions, as well as the “snowflakes” of memos that Rumsfeld would disseminate around the Pentagon like ticker tape off a balcony. Those snowflakes are as impenetrable as McNamara’s fog of war, and The Unknown Known does the service of seeing through them—or, failing that, making the audience aware that Rumsfeld is responsible for the storm.